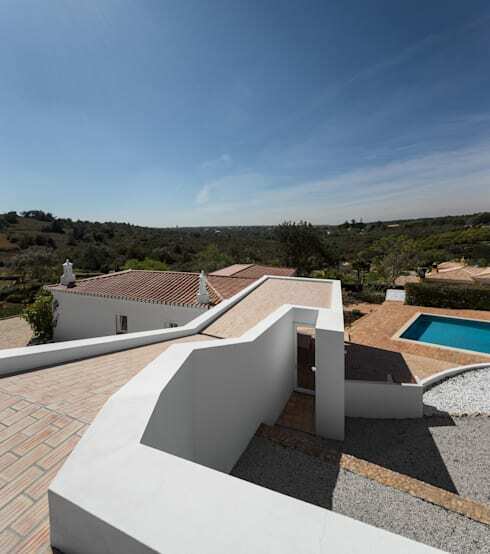 Designed by Marlene Uldschmidt, Casa Vale De Margem is a modern farmhouse that is based in Algarve, Portugal. It is based in the beautiful, sprawling countryside and thus the architects have used every piece of the landscape to their advantage. When we begin to explore this house, you'll notice that instead of flattening the land, the architects have built the farmhouse according to the topography, integrating the landscape into the design. Marlene has explained, The challenging topography of the site was integrated into the concept at an early stage by creating several layers inside the building, which connect to open plan spaces. 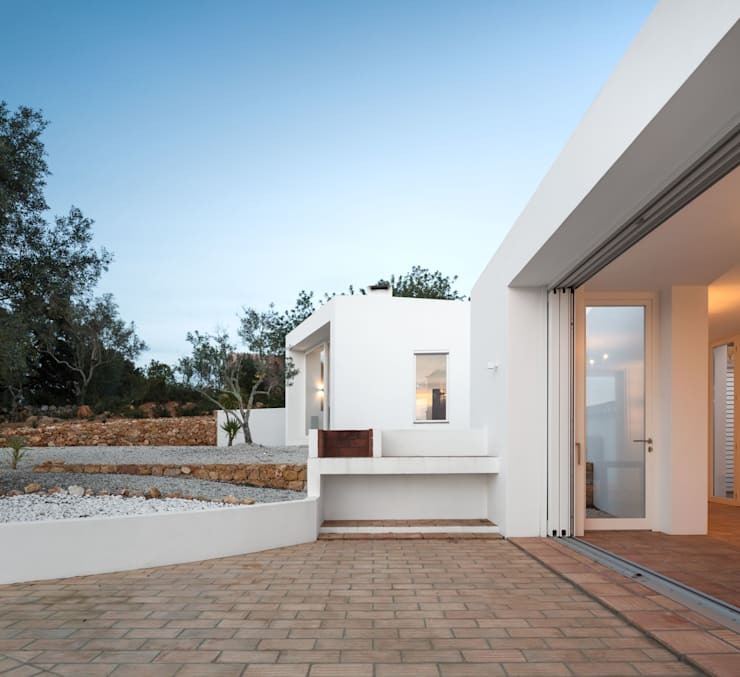 The result is a house of clean lines and minimalist style, that blends into the surrounds. As E.O Wilson said, Nature holds the key to our aesthetic, intellectual, cognitive and even spiritual satisfaction. Case Vale De Margem is a home of peace and tranquility, where one is meant to feel satisfied in every way, shape and form. So let's go explore this farm oasis! Have you ever seen something so simple and yet so magnificent? The exterior of this home is minimalist and modern, adding a touch of contemporary style to an otherwise rustic landscape. This doesn't look like an old-school farmhouse does it? The architects have built at beautiful white building, which features an extra wing. These both face the west, taking full advantage of the sunshine and the gorgeous surrounds. You'll notice that big, glass windows and doors are a main feature, allowing for views of landscape no matter where you are in the house. This is a great tip if you live somewhere with fantastic views! Glazed glass doors and windows also allow for natural light to filter into the house, keeping it warm and insulated in winter. It also means you'll use less artificial lights, saving on electricity. This is both sustainable and cost effective! 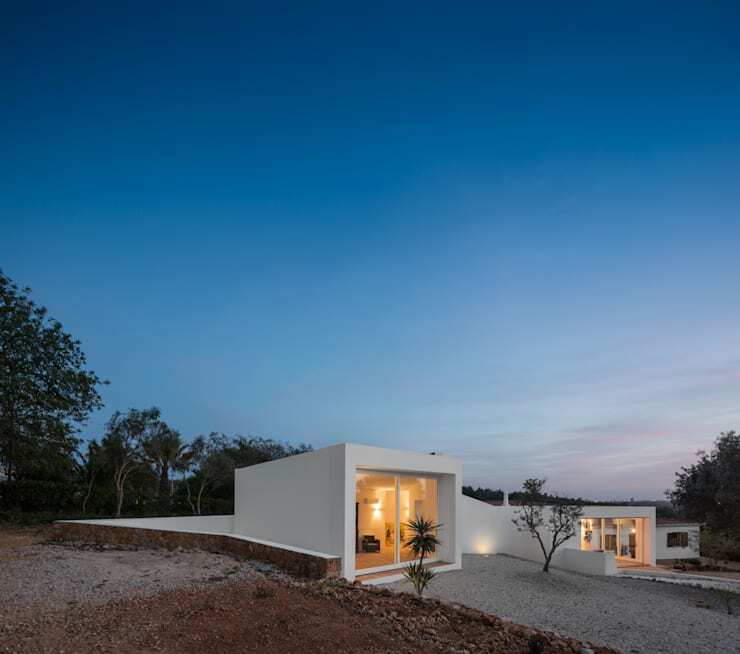 The architects have created a wonderful contrast between the rugged landscape and the clean, simple and modern house. The glass doors and windows also allow for an easy transition between these two spaces. From this angle, it's clear to see how the architects have used the layers of the building to mould into the landscape. By playing with different shapes and using the sloping terrain, a rather dynamic design is created. You'll also notice how the clean, white lines lead down the hill onto the pool area and patio. The pool is a fantastic use of the space, but also remains simple and minimalist. This is the perfect example of subtle design! The colours are also very natural, where the stark white is complemented by earthy stone colours and warm brown and beige. Using colours like this is a great way to create a very natural looking home. We can also see a retaining wall from this angle, which creates a perimeter around the house. It has been described by the architects as a protective cloak around the main building . What is interesting is that the architects used the stone which was excavated during the building to make up this wall. To remain sustainable and conscious about the environment, ask your builders and architects how you can recycle materials while building your home. 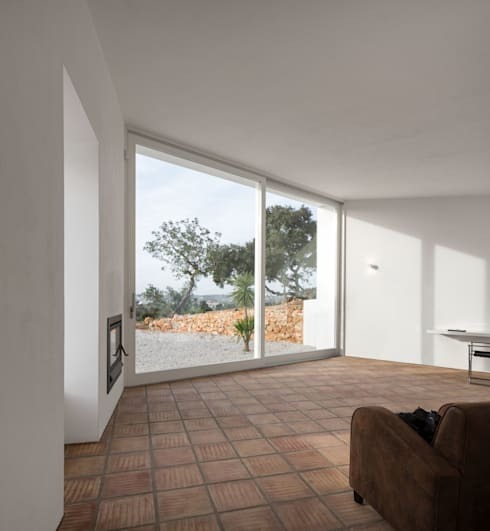 In this case the architects also used local clay tiles, which were used for the original floor of the old farmhouse. Moving into the interior, we can see firsthand the gorgeous clay tiles, which reference the original flooring of the farmhouse. Old school meets modern design! The contrast between the raw, natural landscape and the beautiful, sleek architecture is clear from this photograph, where the glass doors create a transparent barrier between the two. Imagine curling up on the sofa and looking out of the windows onto this, incredible view? There is also a fireplace in this space, designed to keep the room warm in winter. Another large glass window allows for natural light to filter into the room. If you're interested in a fireplace for your living room before winter comes, look at these fantastic fireplace products. You'll notice that the interior and the exterior are very similar, almost mirroring each other. This is captured here in this incredible photograph of the hallway, which leads out onto the clay patio. 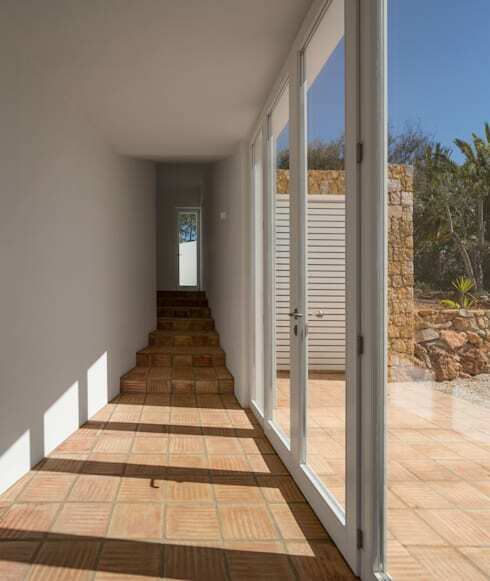 The floors are the same, the white walls are the same—all that separates them is a sheet of glass. The architects know that simple is most effective! There is so much that can be done with this hallway space, where the clean, white walls creative a canvas of opportunities. If you have a hallways in your home, you can do so many things to them to make the house warm, colourful and homely! For starters, you can hang your favourite memories on the wall in the form of framed photographs. Create an incredible collage of them! Or you can opt for beautiful, big pieces of art work that can hang in this space, adding colour and class to it. You'll also notice that when it comes to this house, there isn't too much artificial light needed for the hallway. The glass doors and windows provide an abundance of natural light. The architects have utilised this, staying away from installing lots and lots of artificial lights. If you like the idea of using natural light, don't miss these: Smart Ideas To Lower Your Electricity Bill. One last thing—don't you love the stone wall on the outside, now that we can see it more clearly? The wonderful thing about this house is that the glass doors open up, allowing the exterior and the interior spaces to flow into each other. This is wonderful in summer, allowing the inhabitants to make the absolute most of the surrounds. Not only does it allow for unlimited access to the exterior and the braai area from the interior, but it also creates a much bigger space when entertaining. Imagine warm summer evenings spent braaiing while the kids swim in the pool? There is still easy access to the kitchen and the living room, allowing for the salads to be brought out and the music to be heard. You'll notice that this braai area is a very simple and traditional South African braai, built into the wall. At the farm, there is no such thing as fancy gas braai's or gourmet solutions. This is rustic outside cooking at its best! If we swivel around and look at the braai area from this angle, we can see the space that has opened up onto it from the interior. When it is lit up at night, it's really quite simple and spectacular. How have the architects achieved this? Well, they have stayed away from clutter and from too many pieces of furniture. All they have used are the bare necessities, the basics. If you're moving house any time soon, this is a great philosophy to have. Get rid of all of that junk that you don't need and give it to someone who does! Old desks, clothes you'll never wear again, art work that you hate—throw it all out! It's time to start again fresh, with only the things that you need. If you have a small house, even better. Read this article on: Maximising Space In Small Homes. 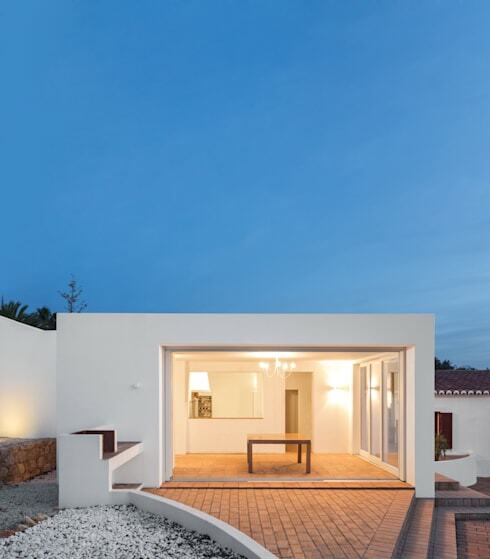 Casa Vale De Margem is the modern take on the farmhouse, moving away from the old school country-bumpkin look and feel and into a new age of clean, simple and minimalist. We can't believe how incredible this house looks against the backdrop of the ruggid terrain! Did you like how this rustic home has incorporated modern design features? Share your thoughts with us!